The Evo Channel is an adaptable module-based channel strip plug-in comprised of 5 highly innovative audio processing modules that include Drive, Phase, EQ, Compressor, and "Touch" an original polymorphic frequency dependent dynamic tool (DeEsser, Expander and a Transient / Sustain Designer). Evo Channel also contains various original elements such as free-form linear phase adjustment, an optimized compressor with 9 selective types (for instrument and bus groups), a unique multi-tool module “Touch” to process transient material in a defined frequency range and lots more. With complete multi-channel support for Dolby Atmos and Ambisonic systems for post-production, the Evo Channel is the go-to plug-in for any sound engineer that needs an ultra-precise great-sounding channel strip that’s fast and easy to tweak. Evo Channel is available in the AAX Native and Audiosuite, AU, VST, and Waves WPAPI formats making it available in all professional situations. Evo Channel also handles High-Resolution DXD Audio with sampling rates up to 384 kHz is supported. In the music industry today the work within the computer has become as important as it has always been with consoles and analog gear. 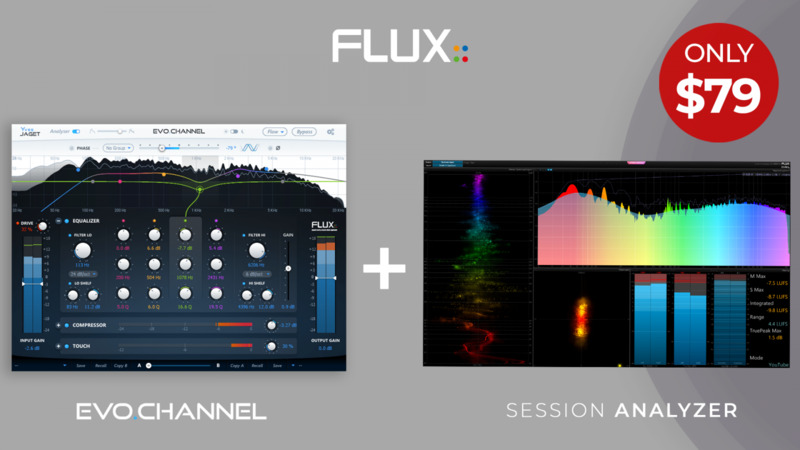 During 2017/2018, Gaël Martinet, the founder of Flux::, and his good old friend and colleague from the French music industry, Yves Jaget, were occupied with the design of a software Channel Strip. The Evo Channel can be considered a utilitarian tool for many mixing/mastering tasks, with each module servicing a need for a particular or required application. Users now have full control and are not dictated by the limitations some other named products impose. Yves Jaget, sound engineer for the last 40 years (Frank Zappa, Sting, Pink Floyd, William Sheller, The Jeff Healey Band... ) has always throughout his career been building his own analog gear; pre-amps, compressors, equalizers, microphones and other things. An important issue for Yves has always been about ergonomics and workflow, and he has been involved in the design of several consoles, including the classic French “Sage Memory”, the first digitally controlled analog console on the market. Yves says: "The tools are there to be of service for the sound production, but should always stay in control of the user and not the opposite - It's still the human who decides!" The essential element of all analog consoles, the basic brick of any mix - The Channel Strip, starting with the gain structure, the tonal curve and the dynamics – This is where it all begins. An adaptable module based design, allowing free movement of channel strip elements in any order. 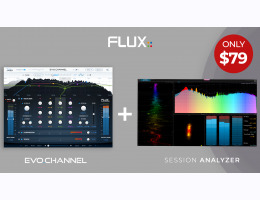 Optimized Spectrum Analyzer, taken from Flux:: Pure Analyzer and Studio Session Analyzer to give accurate overview of the frequency domain. Drive, a Soft Saturation module to add warmth to your audio tracks. Linear Phase correction with zero latency. Proprietary "State Space" technology Parametric EQ and filters, tuned to preserve optimal signal to noise ratio independent of parameter settings. A "multi mode" Compressor taken from Pure Compressor's engine offers 9 types of compressor in one (Start, Kick/Snare, Overhead, Drum Bus, Bass, Acoustic, Piano, Vocal, and Mix), plus a unique auto adaptable release control, parallel wet/dry and easy parameter adjustment. Touch, a multi tool module defined by one of 7 selected modes (Transient Boost, Transient Kill, Sustain Boost, Sustain Kill, DeEsser 1, DeEsser 2, and Expander) to act on a set frequency range. Dolby Atmos and Ambisonic support with up to third order 16 channel. High-Resolution DXD Audio with sampling rates up to 384 kHz is supported. Memory location store and recall for input and output gain controls and all parameter knobs for quick access level and value changes. 50 useful Factory Presets included from Yves Jaget.